Wonder 3 © 1991 Capcom Company, Limited. A horizontally-scrolling platform shoot-em-up in which one or two players control two Elves called 'Lou' and 'Siva'. The Elves are tasked with entering the Demon's castle to liberate the legendary Chariot of Light from the evil demon, Gaia. The Elves are initially armed with a relatively low-powered gun, but new more powerful weapons can be found in some of the numerous wooden chests that litter the levels. In addition, many of the game's enemies – and all mid and end-level bosses – drop heart-emblazoned playing cards when killed. Once enough of these cards have been collected, players are awarded an extra life. Some of the wooden chests also contain heart cards. A horizontally-scrolling shoot-em-up. Chariot is set in the same world as the first game and despite being of a completely different genre, is a direct sequel to it. The two Elves must now fly the rescued 'Chariot of Light' through scrolling enemy-packed levels to defeat the demon Lar and rescue their kidnapped princess. Chariot borrows several gameplay elements from other shoot-em-ups. An action/puzzle game similar to "Pengo" and Capcom's own "Pirate Ship Higemaru", that involves pushing blocks to crush monsters. Control: 8-way joystick per player. Wonder 3 was originally released in May 1991 in Japan. It was known there as the 16th video game made for this system. It is known outside Japan as "Three Wonders". The main character of the action game (Roosters) appears as a striker character (Lou) in "Marvel vs. Capcom - Clash of Super Heroes". Pony Canyon / Scitron released a limited-edition soundtrack album for this game (Captain Commando : G.S.M. 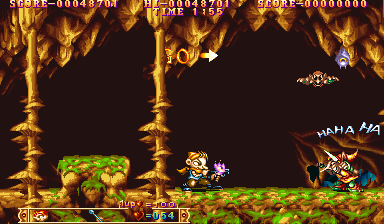 Capcom 5 - PCCB-00083) on March 21, 1992. Here is a list of ports released in Japan only. For ports released outside Japan, please see the Export version entry; "Three Wonders [B-Board 89624B-3]"
[JP] Sony PlayStation (apr.2, 1998) "Wonder 3 [Model SLPS-00927]"
[JP] Sega Saturn (mar.5, 1998) "Wonder 3 [Model T-26107G]"